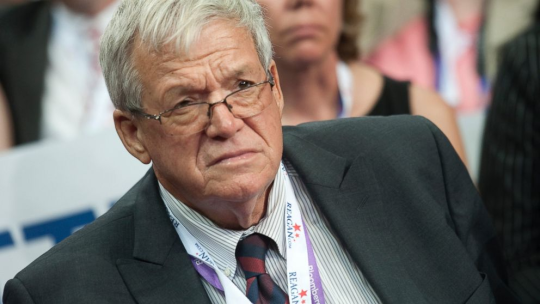 Dennis Hastert former Speaker of the House was molesting young boys in the High School where he worked. YORKVILLE, Ill. (AP) – The small town that boasted of the role it played in Dennis Hastert’s ascent from high school wrestling coach to speaker of the U.S. House spoke bitterly of him on Saturday, a day after prosecutors detailed allegations that Hastert sexually abused several members of the team. The Illinois Republican’s reputation for congeniality contrasts with the government’s portrayal of him in a presentencing filing late Friday as a manipulator who exploited his mentor role to prey on young athletes. Prosecutors say he also lied to investigators about why he agreed to pay one alleged victim $3.5 million, falsely accusing the victim of trying to extort him. The court documents detail sexual abuse allegations involving at least four boys that took place at a motel or in the boys locker room at Yorkville High School, where Hastert taught and coached from 1965 until 1981. It describes a “Lazyboy” style chair where Hastert often sat in the locker room with a direct view of the stalls where the boys showered. An emailed statement from Hastert’s lawyer, Thomas Green, on Saturday – as in earlier defense filings – refers only in general terms to past misconduct by Hastert. “Mr. Hastert acknowledges that as a young man he committed transgressions for which he is profoundly sorry,” Green wrote. These were the people we voted fore and elected and gave our trust and money and taxes and sweat and labour and energy to. Congratulations on being duped and worse if he caught you in the shower room. No pattern of behavior here among our good politicians and clergy and role models? What country was exempt for such politicians and clergy?